Nisse is a functional cosy cottage located in Stage Izumikyo area close to the free shuttle stop. The lower floor has kitchen and laundry facilities, a unit bath-shower room, separate toilet and living room adjoining spacious tatami mat room. 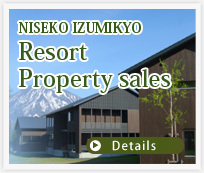 With the loft area's two single beds Nisse is well suited to a family or a group of friends holidaying in Niseko. The traditional style tatami mat room on the first floor can accommodate extra guests on futons (extra stay fee per person).